Hello, my name is Elvin and I have an keyboard addiction. A year ago, I wrote about the CM Storm keyboard with a brown cherry switch. A year later, I have in my hands on another CM Storm keyboard with a blue cherry switch. Have I gone mad? Did I just spent $100 on a keyboard for a different colour? Blue switch. Brown switch. I'm talking about the switch that lives under the key cap of the mechanical keyboard. As I am typing, I am hitting switches. The switch requires a certain amount of force before it activates. 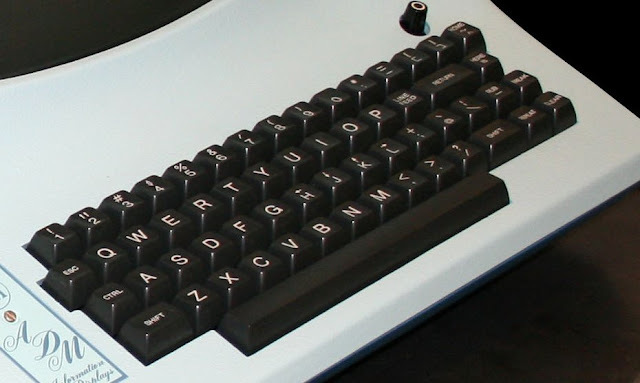 When the switch is activated, a signal is sent from the keyboard to the computer. After activation, there is tiny distance of travel before the switch hits the bottom. When you release the force from the switch, a spring pushes the switch back to its original state. The switch manufacturer could have coloured the switches black and labelled them model 1 to 4. Using colours is a convenient way to label and identify the switch with different features. The keyboard I bought last year has a brown switch that gives a soft tactile bump during the travel of the key. I further damped the sound of the keys by fitting rubber o-rings on all the keys. That makes it only slightly louder than a rubber dome keyboard yet the keys doesn't feel so mushy as there is a spring resisting it. The blue switch is a different beast. There is a tactile bump plus a click sound. The click comes from a slider that hits the bottom of the switch. When you tap one switch on its own, it doesn't sound all that bad. It becomes very noisy when you are in a room with someone else and typing at 80 plus words per minute. Here's the kicker, that noise is only distracting to the person who isn't doing the typing. To the typist, the clicky feedback sound can be extremely satisfying. Compare the sound recording I make from typing the same sentence on both keyboard. The blue has a higher pitch due to the click of the slider. I can type lightly and the blue switch will sound softer. To do this, I do not depress the keys all the way down (this is known as bottoming out). As soon as I feel the switch is activated at the mid point, I can move my finger on to the next key because the signal is sent. This cannot be done with a rubber dome keyboard because the dome has to be depressed fully before the metal piece completes the circuit. It's a pity that I can only convey the feeling of typing using words and sounds. The feel of a mechanical keyboard is best experienced with touch. However, spending $100 on a keyboard just to try out the feel of the key sounds like insanity. After typing the blue switch for a week, I am still torn between which is better. If I am typing alone in my room, I will go for the blue switch. If I am using this in my workplace, going with the brown switch is a more considerate choice. I shall hold back my verdict for now and update this again after using the keyboard for another month. Most people don't care about their keyboards enough. It's just another device to input text. When I am writing programs or posts for my blog, I like to use a good keyboard. More than important than the quality of the keyboard, it is the layout of the keys that makes or breaks a keyboard. Yet, some manufacturers like to "redesign" the keys on the keyboards for no obvious reason. I'll give you an example. On the first day of reporting to work a few months back, I was provided a brand new HP workstation. After settling in and working on my program, I faced a weird problem. I keep hitting Enter when I wanted to hit the back slash "\". My mind and hands were out of sync. There was something wrong with the keys. On closer inspection, I realised that the HP designers have changed the Enter key to make it longer and shifted the back slash "\" down. Furthermore, the Home and End keys were changed from a vertical to horizontal setup. 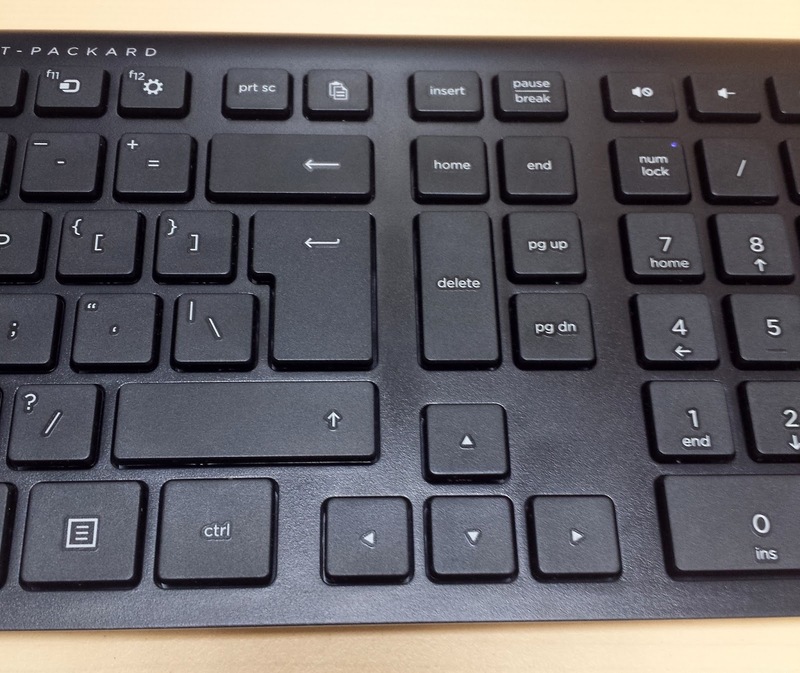 If the new design was to save space, it only shaved off one key size but made the layout confusing. See the photo below. I fought with the keyboard for a week, thinking that I will get used to it eventually. In the end, the keyboard won. I slipped away from work during lunch, bought a HP keyboard of an older design and quietly replaced it. My colleague noticed that and casually commented, "You got a new keyboard." "Yea, the keys were all wrong on the other keyboard. ", I replied. "Really?! Where are the keys wrong? ", he asked incredulously because he was using the same keyboard. I pointed out how the enter key has shifted bumping down the slash key. He mumbled that it's just a different design from HP. I retorted, "You don't move the keys on the keyboard so that you can have a different design. The keys on the keyboard should stick to conventions." Our conversation stopped there and he went back happily to using his keyboard. I know I sound like an old man but I'm all for change if it makes sense. That change that HP did right there is rubbish. Are we expected to relearn our muscle memory so that their keyboard layout can look good? This is the HP keyboard that I bought: the model KU-0316 (cost $10 in Sim Lim Square). 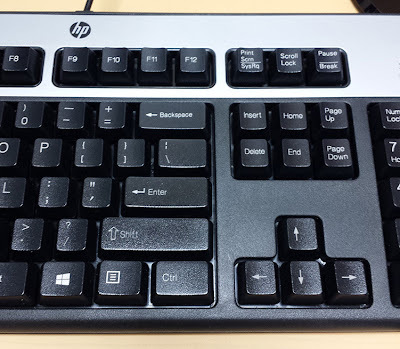 This classic keyboard is commonly found in offices here. For a rubber dome keyboard, it's pretty good and more importantly the keys are in the right place. This keyboard can take a lot of abuse - I banged out codes on this keyboard for five years and the keys feel as good as new. The only time I saw this keyboard got butchered was when my intern spilled soft drink all over it. I observed a minute of silence that day. That much has changed in the last 39 years. I feel that the layout of the keys has reached a stable state now and it should not change much for the next hundred years. Yet, I have the nagging feeling that my children will one day read this and mock me on how wrong I was. And that is why I feel that most people don't care about their keyboard enough. If they can put up with a "wrong" keyboard, they care much less about how the keys feel when they type on it. There was a time when computers were controlled entirely with a keyboard, no mouse. 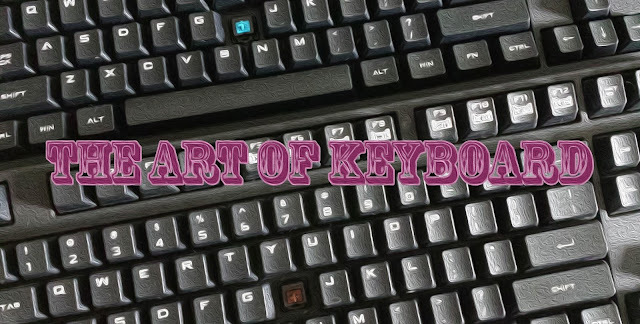 With the rise of the soft keyboard on touch screen devices, the art of keyboard will soon be lost. Maybe because I'm a programmer that I feel a connection with my keyboard. Like the guitarist who appreciate the subtle difference each guitar feels when he strums his fingers over it. Or the cyclist who notices the ride changes with a different bicycle. The tool speaks to the user. Or maybe I just am old-school. But I really love the keyboard I am typing on right now.